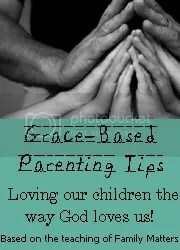 Grace-Based Parenting Tip #4 & Giveaway! *UPDATED* Congratulations to Madsen’s Memories on winning the Parenting Cd! For the last several weeks, I’ve shared some of the great parenting information (here and here) that I learned at Family Camp and thru Family Matters Resources by Dr. Tim Kimmel. I picked up some great ideas from the conference. And one of them is called What’s Your Beef Night. Treat them to their favorite item on your family menu. Allow them to candidly but respectfully share anything that you have done to embarrass, frustrate or anger them. This opens the way for them to have a private “What’s Your Beef?” moment with you anytime they need to. We just had our first one. My older kids are 8 and 6 and they chose cheese pizza. What a surprise. We also let them choose where we’d eat it. (I was thinking patio, formal dining room). I never saw the floor coming. But it was their night. Point taken. It was hard for me not to defend myself. Later after our meeting, I announced that one day a week, kid’s choice, they could leave their beds unmade for the day. I’ll just not go upstairs that day. The rest of the meeting went really well and we talked about our upcoming One Day to Give plan and some other changes we’re making in our family. (Oh yes, I’ll be sharing later). We have a family dry erase board in a high traffic area of our home (thanks to my real life friend Karen for the idea!) We keep a family calendar there and jot down important reminders. I told the kids we’d schedule a “What’s Your Beef Night?” every once in a while. I want to create an atmosphere of grace in my home. I want my kids to be able to candidly, but respectfully tell me what’s on their hearts and what they are struggling with. I really had to resist the urge to defend myself in our meeting. I’m very good at laying down the rules and barking out orders. I was reminded that I need to stop and listen. Because my kids might be trying to tell me something. Family Matters sent me an audio CD to giveaway to a reader today. It’s called The Three Inner Needs of Confident Children. And it is excellent. If you’d like to win it, please leave a comment by 10 pm (CST) Wednesday night. This great family resource has also recently entered the blog world. Y’all know how important it is to send newbies some love, so go visit Family Matter’s new blog! Thanks for sharing! It’s hard getting rebuked by your own kids isn’t it? What a great idea and a beautiful way to build a family full of grace! As parents we often forget our children are “people” too, not just our children. Its good for them to learn to air their grievances and concerns in a loving and peacful atmosphere. Makes for much better relationship building throughout their lives. Kristen,thanks for sharing these “Grace-Based” parenting tips! I know I’ll learn much more from you. Think we’d need a “what your beef?” weekend to have time to cover everyone’s complaints around here. Great idea though. Hmmm, would love to create the time for something like this at our house. Thanks for sharing. I love this tip, Lisa! This not only great for our children, it is wonderful accountability for us. Thanks for sharing it. What a great idea! I like how this keeps the communication lines open. I love the Family Matters material I’ve read so far. They have such helpful resources for parents who want to love with grace. I’m looking forward to reading more on the new blog and more of what you have to say about the changes in your family. One thing we’ve found that we have to be very intentional about is empowering our kids with confidence, while carefully avoiding an attitude of entitlement. This cd sounds very helpful! I would love to win the audio CD. It’s funny, well maybe funny is not the best word, but I just blogged about the terrible day I had with my kids and such just before visiting your blog. I cried when you talked about your little boy saying that the yelling hurt his feelings. I think my kids might have a lot of “beefs” with me lately. This sounds like a wonderful idea! I know it will bring your family together in a way that nothing else can. I, too, am a great Drill Sarg. I need to implement this at our home. I’d love the CD! Keep up the great work you’re doing as a family. i love the idea of letting the kids pick the dinner and WHERE to eat it! i was just discussing tonight with my DD4 what her favorite dinner is and am planning to make it soon but she will like picking where to eat even more! i hope to have a hope with open and respectful communication as a norm rather than a rarity. i’m sure resources like the one you are giving away will help us to build that kind of environment. thanks! I’ve been reading your blog regularly for a few weeks now but this is my first time to leave a comment. I really get a lot out of what you have to say and I appreciate your heart to share God’s grace and love with us (your readers), your family, and your friends, especially the family of persecuted Christians from Russia. I don’t know if you are willing to send the CD internationally (that is, if I were to actually win) but, if you are, count me in for the giveaway. If not, that’s ok. Thanks again for your blog. I really enjoy it! amazing… i need this book. i’m not a mom–yet– but i am getting that book!! I really like this idea! I will have to try really hard not to defend myself, tho. It’s going to be my first instinct. Our small group at church is starting the Grace-Based Parenting study on Oct. 19 – I’m really looking forward to it, especially after what I’ve read here! What an awesome simple idea. Thank you so much for sharing. I look forward to planning one over here. What a great idea and means of keeping the lines of communication open. I think it’s important for kids to know that we (parents) are human too, make mistakes and need forgiveness. The CD sounds wonderful. I’ll have to check it out. Thanks for sharing your journey and your experiences, Kristen. I find them so inspiring. This is a wonderful concept. It’s nice to know that you can relate to someone. Taking my three little ones out in public is like herding chickens and can be quite taxing. Keep sharing and I know you’ll have many that will enjoy the journey with you. Thank you. wow. i’m impressed. i would love to win…sounds like a great parenting tool. I’m sure I need this, too. This refining process takes a lifetime, doesn’t it? Fantastic idea!!! My oldest is only 3 and I don’t know that she’d get it. She’s pretty good at telling me to “Stop it!” if I yell or get angry with her. What a great idea! I so want my kids to grow up in an atmosphere where they feel they can really talk to their Dad and I. This seems to start the groundwork now while they are young, which can really come in handy when we go through the teen years. Thanks for a great giveaway, too! Wow. What a great idea. Thank you so much for sharing this. I am going to do the same thing as my kids get older. Looking back I can honestly say it would have made a difference when I was a kid. OMgosh what a great idea! I have 6 kids and I can’t wait to start this!! I love hearing your ideas for bettering your family…keep ’em coming! I love the concept for a What’s your beef night. I also like how you set boundaries, that even though they are free to share what’s bothering them, they still need to do it in a respectful manner. 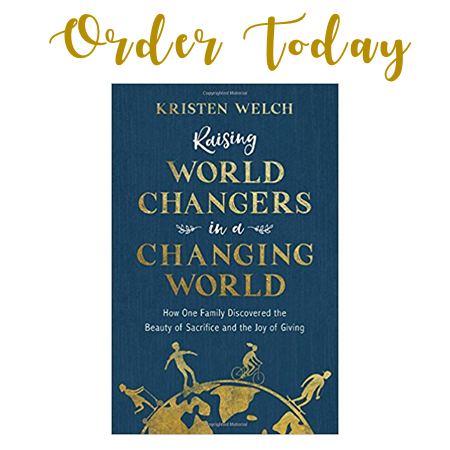 Kristen all these changes you are making will really be instilled in your kids hearts! When I was a single mom with my older two..I made sure no matter what that we ate at least one meal together.. at least 1. 4 years ago when we were moving, my oldest son..who was close to 20 stayed with a family (so he could stay in college)that NEVER ate together. He was so upset by eating alone every night, that HE got them to enjoy a meal together. By the time we got moved that family was eating everynight together. all to say YOU are making a difference in your kids! if i am successful in raising my son to be a confident child, i will consider that the greatest accomplishment of my life. thanks for being *that* family, and sharing all of it with so much grace. I love this idea. Thank you for sharing it! You don’t know how much this spoke to me this morning. I feel like sometimes I bark too much and being able to let my kids speak their mind without defending myself would be hard. THank you so much for sharing this! Sounds really good – I have 2 boys – 7 & 12 – I need to try this with them! GREAT idea! My heart melted when I read your son’s “beef”, and I could totally relate to your daughter’s comment. My daughter is only two years old, so she openly shares her complaints with us on a regular basis. =) But I will definitely file this idea away for future use. Thanks so much for sharing! what a great idea! I love your blog! Y’all crack me up, and in this crazy family, it’s nice to laugh at someone else’s foibles! Oh man, I would have cried if my child had told me what your son did! You are such a sweet mom to give them an opportunity like that! Wow, I am impressed. It’s hard to be humble, but you are pulling it off with such…well, grace. But I have to say – “what’s your beef?” translated to me as “where’s the beef?” and I couldn’t get that old woman from Wendy’s out of my head. Somebody should talk to her about attitude. What a great idea. I have got to share this idea with hubby. Our kids are a bit younger, but I know we need this kind of thing. I can see it on their faces sometimes. I know there’s something bugging them, but I just don’t have the time to discuss it right then. This would give them a chance to “air their beefs” without it becoming a whining session. Wow, what a wonderful idea! Our kids are a tad young for this, but it is definitely something to keep in mind for when they get older. I am going to check into that new blog that you posted! Very interesting idea. I know that my son has had his feelings hurt by our yelling (I consider it raising our voices – I don’t think he’s ever heard real yelling) and we’ve had to ask forgiveness before. It’s humbling. I love this idea. What age do they recommend using it with? Mine are 4, 2, 1 and I am wondering if they are still too young, though perhaps we could adapt it. I wanted to tell you I heard Dr Kimmel speak last week in Dallas at the MOPS conference. I had signed up for the workshop in May and forgotten which choices I had made. When I got there and saw, “Grace Based Parenting” I got all excited, saying to my real life friends, “My blog friend has been talking about this for weeks now… this is going to be SO good” But they didn’t get it…they aren’t bloggers. Anyway, I didn’t get to buy his material, but I SO want to. I def want to use this stuff in our home. I feel like some of it we do already, but we can def afford to make some changes as well. GOOD STUFF!! I love this idea, and echo your desire for an atmosphere of grace in your home. Thanks for sharing! We all need great ideas like this! Thanks! I love this! I’ve noticed that the world is stealing too much of our time lately. What a wonderful way to claim it back and build a stronger relationship with my children. thank-you. As a parent without much confidence in myself…I would love to see my daughter have confidence in herself. And maybe I could learn something, too! Wow! What a great idea!! I love the idea of creating a grace filled home where the children grow up knowing AND experiencing a voice and grace. Thanks for sharing this! Thanks for sharing! What a great idea for a family night! My Teens have no problem voicing opinions, however, it’s the respectful part we need to work on. Perhaps my hubby and I can start this with our son though. Sounds like a tough but healthy way to get stuff out in the open. Thanks for the giveaway chance too. I would love to win this CD. My kids like yours are 8 and 6 and we have a 4 year old as well. Your tips on grace based parenting have been so insightful. Thank you sharing the brave changes you have been making. What a great idea! Thanks for sharing it. I hope I remember to implement it when my children are older; they are 2 1/2 years and 8 months old. I felt myself hang my head in shame when your son described yelling and that he doesn’t like it. well, point taken. I did a tiny bit of yelling myself today. haha. I also liked your solution that your daughter can NOT make her bed once a week, and to not get annoyed…you will just avoid that room for the day. I think that was brilliant. so thankful I wandered her from WFMW…what a great tip (I'll be looking at your others too). Of course that book has been on my list to read for a while & I just haven't gotten to it. That is wonderful! My little one is only 3 so this won’t work just yet, but in a few years. I really enjoyed that tip. I’d like to incorporate that one into our home. Thanks for sharing it. What a wonderful idea, and it sounds like you really saw the fruit from it immediately. This is a great idea! I would love to implement it into our family times. Love this idea! I’ll be sure to check out the blog. I hope I’m not too late – I just got here! LOVED this post – I’ll definitely have to try it! Am I too late also? I LOL at today’s post! This is such a good idea! I already let them chose a meal of their choice, but not where to eat it. But I don't the What's Your Beef with them. Excellent idea. My son & I have a really close relationship. He has no qualms telling me his beef. My daughter? Complete opposite. Maybe this will have her open up more. I’m squeaking in under the time limit! Hello, I know our children don’t come with a manual, but this one definitely sounds like a great base! Thanks for sharing that. Excellent advice. As always. I am so glad to win! Thank you! Do you want my address? Cho-Yeh is a premier Christian Summer Camp and Retreat Center just 1 hour north of Houston. Loaded with fun activities like archery, paintball, horseback, riflery, blobbing, wakeboarding, waterskiing and more, Camp Cho-Yeh is one of the most exciting Christian Summer Camps in Texas! Thanks for the help with this. It is always messing me up.